A super smart colleague of mine just did a great modular test webcast entitled "Optimizing PXI Modular Functional Test System Throughput." Below you will find an overview of the webcast and at the bottom a link to the webcast recording. Reducing overall test time in high volume electronic manufacturing sites is critical to meeting manufacturing capacity and cost targets. Optimizing throughput, while not sacrificing test coverage or production yield, is essential to retaining a competitive edge. Best-in-class manufacturers use statistical methods during test system development to achieve high throughput without compromising test coverage or test yields. During test system development, statistically based Gauge Reliability and Repeatability studies are used to verify the stability of the test methods and test system. After establishing a reliable and repeatable test, methods to optimize throughput can be explored. The statistical methods can be used again to verify test throughput optimization will not impact test yields. This Webcast will explore these statistical methods used during electronic functional test development and deployment to help the test engineer achieve accurate, reliable results. Today (April 18th 2011) Agilent is announcing the discontinuance of the popular 53131A, 53132A, and 53181A universal counters. A custom component used in this counter family is no longer available and is forcing this unplanned product discontinuance. The last order date for this counter family is November 1, 2011, subject to availability. Compatible replacements exist. The new 53200 Series of Counters are functional equivalents to the previous generation counter family with vastly improved performance, features, and usability. They include “53100 Emulation Mode” enabling 53100 Series Standard Commands for Programmable Instruments (SCPI). 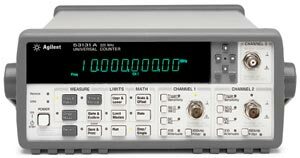 You can also read the Agilent RF & Universal Frequency Counter/Timers Programming Comparison Guide for a list of those areas where 531xxA Series users might find differences in operation when using a 53200 Series counter. These differences are few, but documented in order to make it easier to verify programs. When 531xxA Series compatibility mode is selected, all programming is performed through one of the 53200 Series’ remote interface (LAN, USB, GPIB). The counter display responds according to the remote commands received. Pressing any front panel key while in 531xxA Series compatibility mode returns the counter to 53200 Series mode as prompted. Click here for more information on Agilent’s 53200 Series Counters. This is a two part blog post is based off a great tutorial I read titled “Tutorial on Ground Loops” by P. M. Bellan. A link to the tutorial can be found at the end of the post. The subject of the two part post is something you won’t find in textbooks from your EE courses, spurious coupling mechanisms in circuits and test systems and how to prevent them. A spurious coupling mechanism is any outside unwanted voltage or current source entering a signal path. There are five main spurious coupling mechanisms: direct conduction, capacitive coupling, inductive coupling, radiated electromagnetic field pickup, and ground loops. The part one post focused on the first four types of spurious coupling (click here for part one). In this post we will focus strictly on ground loops. Kirchoff's law tells us the total DC voltage in a complete circuit (Vloop) is zero. When considering AC components in a circuit, Kirchoff's law is superseded by Faraday's law. With Faraday's law Vloop = - dF/dt. F is the magnetic flux in the loop. The magnetic flux is given by F = BA. B is the magnetic field linking in the loop and the area of the loop is A. Faraday's law is what makes the basis for Transformers, inductors, and also ground loops. The make up of a ground loop signal depends on linked spurious time-dependent magnetic flux produced by nearby external circuits (fluorescent lighting, switching power supply, motor, computer) as well as the resistance and inductance in the loop. The figure below shows and example of a measurement setup where a ground loop is created. The ground loop is formed by the the measurement instrument being connected to ground, the sensor or device under test (DUT) is connected to ground, and both instrument low sides are connected together via the shielding in the coax cable.This creates a loop (shown in green) for spurious time-dependent magnetic flux to enter (shown in blue) and creates unwanted current flow (shown with green arrows). Eliminating the ground loop in the above example is just a matter of locating and eliminating the inadvertent short (assuming you know it exists). What if we are making a measurement on a DUT that is suppose to be grounded? In this case we can look to our measurement or test instrument to brake the ground loop. For instance most high quality DMMs and power supplies have their low side connector isolated from ground with the option to short it to a ground potential. In this case you would want to ensure the low side connection of the instrument remains isolated from ground to prevent a ground loop from being created.Of course the isolation does have some finite impedance for DC and AC that you may want to check in the instrument's specifications when performing sensitive measurements. Some test and measurement instruments, such as scopes, typically have the low side connector tied to ground. In this case you would need a differential circuit (differential probe for scopes), isolation transformer, or optical isolation to break the ground loop. These types of ground isolation methods introduce their on limitations on the measurement. The next example involves a multi-channel measurement setup and each channel shares a common low side connection. This setup may be a instrument, such as a digitizer, with multiple channels or a complex test system with switching. This time a loop is created between the low sides of two measurement channels as shown in the figure below. One common way ground loops of this type are broken is by disconnecting the shielding or low side return from either the instrument or the DUT. This method will brake the ground loop but it will also degrade the signal since it brakes the signal path return. The third example ground loop involves two test and measurement instruments connected together. As shown in the figure below, each instrument is connected to ground and the loop is completed by each instrument's low side being connected together. This type of ground loop can be broken if one of the instrument's low side is isolated from ground. Breaking the loop: As mentioned throughout the post, there are multiple ways to break the loop to eliminate ground loop error including remove an unintentional short, use an instrument with an isolated low side, use a differential circuit / probe, use an isolation transformer, or use optical isolators depending on your application. Increasing inductance of loop path to decrease loop current: By adding inductance, and therefore impedance, into the ground loop you can lower the ground loop current without affecting the desired signal. This can be accomplished by wrapping cabling, whether it be twisted pair or coax cable, around shield beads, a ferrite core, or an iron-core transformer. The more turns the more inductance is added to the loop. For a real world example of this look at the video cord on your computer monitor it will most likely have an iron-core around it. This method is more effective for higher frequency or sudden transient ground loop signals. Removing linked magnetic flux: If possible remove noisy devices out of the test measurement area. This could mean moving a test away from a motor or replacing a switching supply with a linear supply.